Curly hair is a blessing! Although some days, some of us may beg to differ. Some days our curls look perfectly sculpted and bouncy. Other days it is as if our curls have a mind of their own, resisting to be tamed. Even if you follow the same routine, using the same products and techniques each day, your curls never look the same way twice. … unless you have a hood dryer or the patience to defuse it without touching or disturbing your curl pattern. We need to be educated on products, not to be left to the weather’s mercy. Quickly, we fluff up the roots and set our curls free from being stuck to our scalp. Now this is what it is all about. If we brushed our hair, it would separate our curl families. We finger comb or use a wide-toothed comb and leave-in conditioner, styling curl creams and mousse have very important purposes for us. Once dried, we’ll shake out our roots only, setting your hair free from being stuck to the scalp. Now, our hair falls in its own voluminous curly patterns, looking lush and full and – of course – amazing. The last thing you want to do is disturb your natural curl pattern, distorting the authentic and real looks that your locks provide. Senior stylist and master colorist Leslie, from Leslie Ellen Curly Hair salon NYC, is a seasoned pro when it comes to helping clients look and feel their curly-haired best. 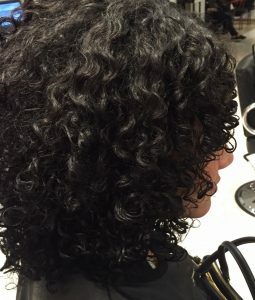 With product suggestions, care tips and styling techniques to help harness the natural beauty of your curls, she can help you find the perfect look and love your locks. To learn more, or to schedule an appointment or free consultation, call Leslie at 718-926-4050 today!